Our Belletrista Bag is On the Move! Did you guess where our Belle bag is? When most are asked about Texas they think of cowboys, barbeque and heat. 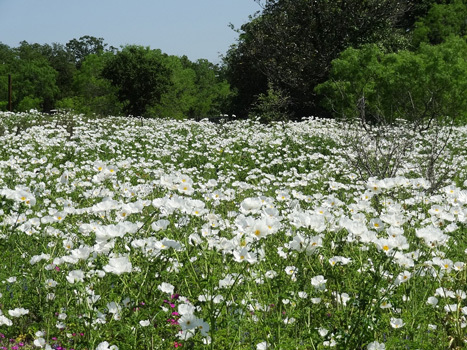 While those things do truly exist, it would be a shame to overlook a beautiful Texas spring. 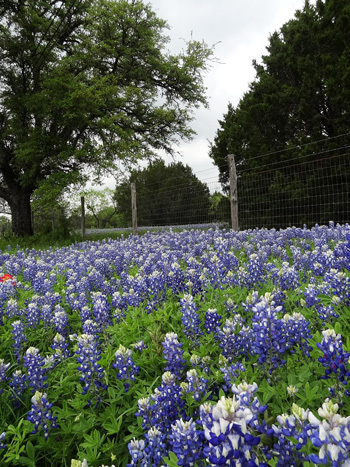 Because when Texas gets the right April showers, the May flowers come out in full force and the Texas countryside becomes a beautiful field of blue, red, yellow, white and purple. And if lucky, one can even spot a few longhorns in the midst. 1. 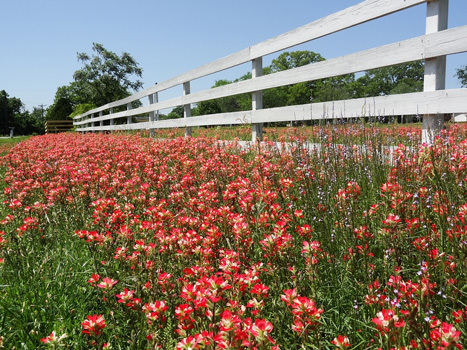 A blue sky, a white picket fence and Indian Paintbrushes make for a gorgeous snapshot on a small Texas country road. 2. 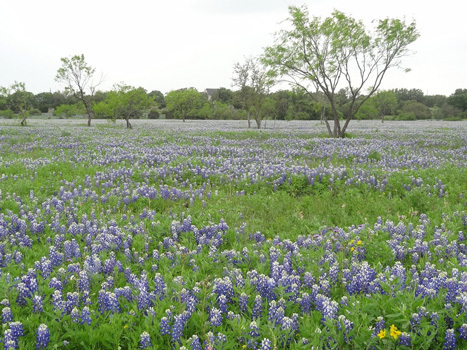 The state flower, the Bluebonnet, yields fields of never-ending blue. 3. 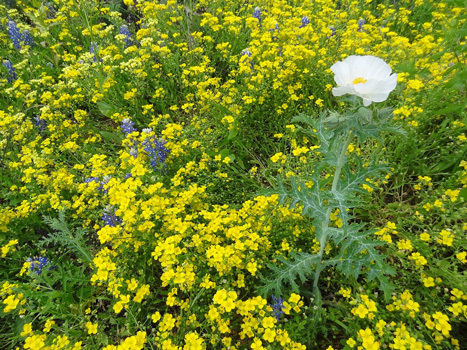 These gorgeous White Prickly Poppies stand at waist-height and provide a snowy atmosphere to a Texas field. 4. The different flowers of Texas nestle together to create the most intoxicating, sweet aroma. 5. Bluebonnet create rivers along the road, flowing in and out of fences and trees. 6. 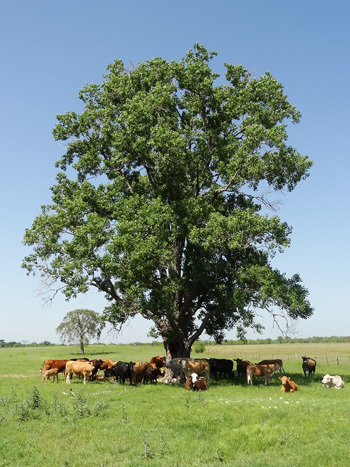 Cows on large-acre fields seek shelter from the heat under the only tree available. Is your Belle bag travelling? 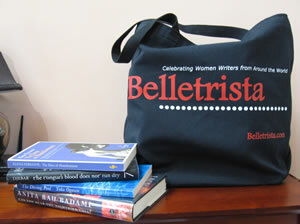 Email us at editor [at] belletrista [dot] com and tell us about it! Belletrista, Inc. is a nonprofit, US corporation awarded 501(c)3 tax-exempt status by the Internal Revenue Service. As a nonprofit organization, we depend on charitable contributions to cover our operating costs. Please consider becoming a part of Belletrista's international community of readers by supporting the magazine with a donation of any size. 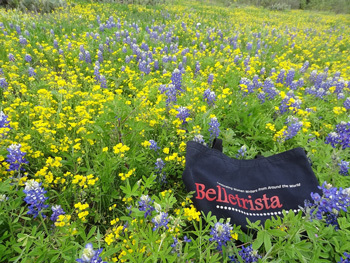 To thank individuals who donate $50 (US) or more, we will send you our fabulous Belletrista bookbag (perhaps you could take it traveling)! Go green with this lightweight, durable tote bag made from 100% recycled content (80% recycled cotton, 20% recycled plastics). Donate via personal checks drawn on a US bank.